The Manx cat is best known for a peculiar trait: an almost non-existent tail. This unique feline is native to the Isle of Man (hence the name) and experts believe it shares ancestors with the British Shorthair. The Manx's unique characteristic is due to a mutation of the spine that happened hundreds of years ago. This peculiar mutation caused many Manx kittens to be born without a tail. After many generations, and because of the relative isolation of the island, this trait became the norm. The Manx is a sturdy, solid type of cat. Manx cats have a wide chest, short back and deep flanks. They have a round physique: round body, round face, round paws. Their hind legs are longer than their front legs, thus causing their rump to be higher than their shoulders. Manx have very powerful hind legs and are high jumpers. Indeed, Manx kitties love perching on high places. In addition to their round appearance, and as I mentioned before, a signature trait of the Manx is their lack of a tail. Actually, Manx have different types of tails. Interestingly, even though the Manx gene (tailless) is the dominant gene, most Manx felines that inherit said gene can still have a full tail (known as "longy"). They might also be born with no tail ("rumpy") or just a very short tail ("rumpy riser"). 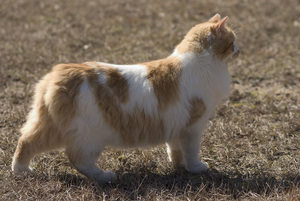 A Manx can also be a "stumpy", which refers to a tail of short-length. Despite this variety of tail lengths, only the "rumpy" and the "riser" are accepted for competition in the United States. Manx kitties come in two coat types: short hair and long hair. Their coat is very silky and soft to the touch. Interestingly, the Manx have a double coat, making it extremely plush and soft to the touch. --Male cats of this breed weigh around 10 to 12 pounds on average while females weigh an average of 8 to 10 pounds. --The tailless gene can be fatal when two rumpies are interbred after or beyond the third generation. --The CFA accepted the Manx as a breed as early as the 1920s. Manx cats occur in all the colors and patterns. They come in tabby patterns, including classic and mackerel tabby. You will also find tortoiseshell Manx, calico Manx, bi-color Manx, and solid color Manx. The color variations include red, silver, brown, white, black and brown. The Himalayan (pointed) pattern is not accepted by all cat fancy organizations. Manx are very playful and affectionate. Manx kittens and cats also have many traits that would be associated with dogs, such as hiding and burying their toys. Manx will also follow you around, just like a dog. Overall, they bond very well with humans, making them a very nice family pet. You will find many stories, myths, and legends inspired by the Manx. One legend says that the Manx lost its tail when Noah closed the ark’s door on the cat’s tail just as it was entering it. According to the legend, it had started raining hard and Noah wanted to prevent the water from flooding the ark. Another tale says that the Manx was a descendant of cats that lived on a ship that was shipwrecked on the Isle of Man. Yet another tale argues that the Manx felines came in a Spanish Armada ship that ended up on Spanish Rock, on the coast of the Isle of Man. Many legends in many cultures mention tailless cats, including the Welsh. Indeed, Welsh people considered Manx cats to be sacred beings. --Gordon the cat from the TV animated series Catscratch (nickelodeon). --Mac Manc McManx, also known as Mac, is a recurring guest character in the daily comic strip Get Fuzzy. --Mayor Manx from SWAT Kats,an American animated series. --The tailless Stimpy from The Ren and Stimpy Show. Stimpson "Stimpy" J. Cat (that is his full name) is believed to be a Manx. --Koko, the famous gorilla that can communicate with humans, has adopted three Manx cats (All Ball, Lipstick and Smokey) as pets. --In 1988, the government of the Isle of Man introduced a "cat" crown, showcasing a Manx feline. Visit this site to learn more. --The Manx has been adopted as the Isle of Man’s symbol. --Artwork - Manx-inspired cat pictures including posters and prints. You can also check these gifts inspired by Manx kittens. Do you want to learn more about Manx cats? Check out the tomes listed below. These make great cat lover gifts, too.